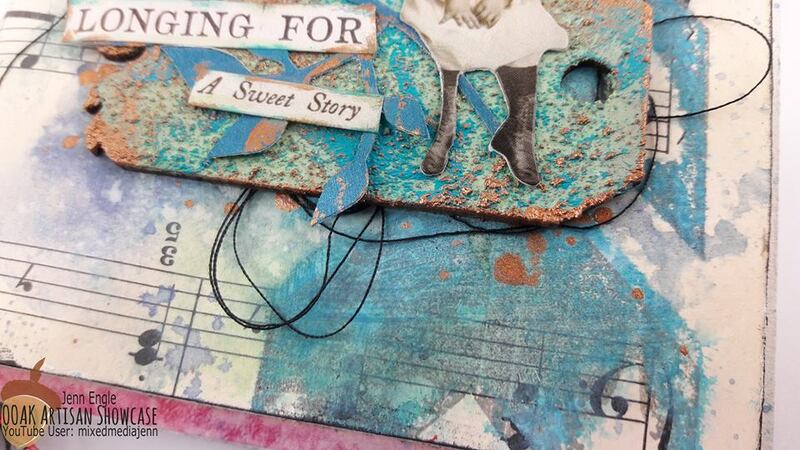 I started out in my handmade journal which has a page of sheet music. 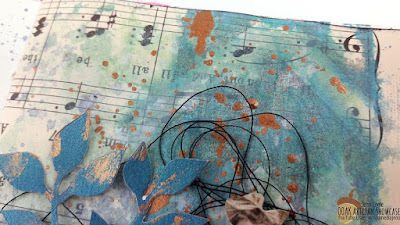 I used clear gesso over my page to keep the integrity of the music notes. 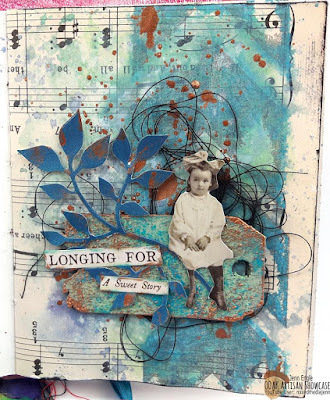 Then, I got out my octagon shaped mini Gelli Plate and some Distress Oxide ink and used the plate to ‘smoosh’ color all over my background. I used 3 different colors of Distress Oxide to get varying shades. After that, I used a chevron stamp and the Distress Oxide to stamp a line of chevrons up my page. I activated the Distress Oxide by spraying it with water, and to blur out the edges. Then, I used a grey ink to stamp my chevrons again to bring back some definition. Then, it was time to work on my focal image. I used a piece of chipboard in the shape of a mini tag and a Patina Effect Paste from Finnabair. 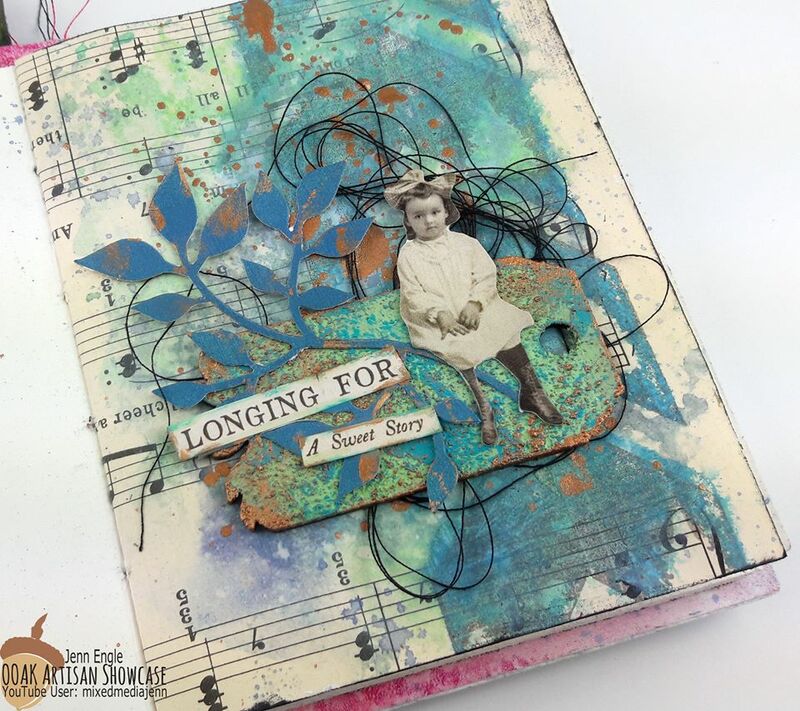 It’s a 3-step process and makes this incredible texture and color on your piece. I just love the stuff. Now, it was just time to assemble my focal cluster. 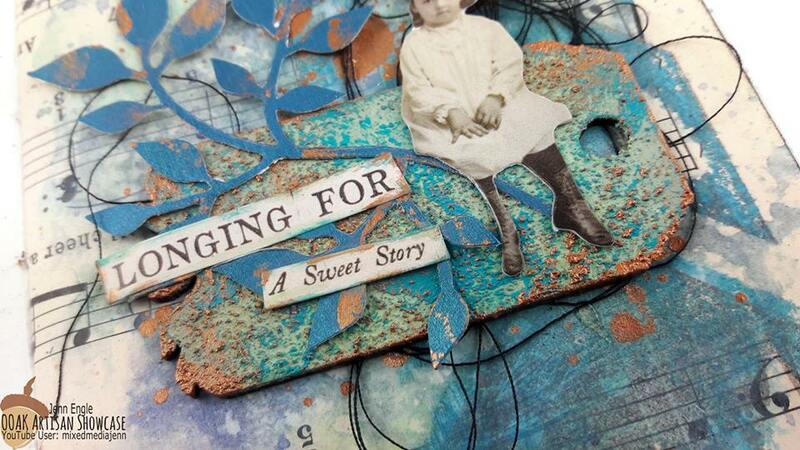 I put some black thread, the chipboard tag, a leaf diecut and a Paper Doll from Tim Holtz and glued everything down. I finished my page off with some stickers by Tim Holtz that are supposed to look like phrases cut out from books. And that was it! Be sure to check out the video to see the entire process.